Expat Life with Chickenruby: 105 My Sunday Photo January 1st 2017 - D is for Disappointment. 105 My Sunday Photo January 1st 2017 - D is for Disappointment. Dubai is growing quickly. This is our 3rd New Year here. Our 3rd night on the beach to watch the fireworks go off from the Burj Khalifa, Burj Al Arab and the Atlantis Hotel. I have been thoroughly spoilt living in Dubai, I have come to expect a certain standard of living, we can't afford the 'high' life, but we do sample what we can and when we can. Every year in Dubai the New Year has just got bigger and better. 2014 we spent on the beach at JBR. The area was still not fully open and there were around 2000 people on the beach, last year some 20,000. 2015 we set up camp on the beach at the bottom of our road and watched the fireworks go off everywhere, including a 5 km display out at sea, which lasted almost 20+ minutes. It started at the Burj Khalifa, up to the creek, along the sea and finished at the Burj Al Arab. 2016 focused on the new canal area, which we could see, but the fireworks all went off at the same time this year. We used to enjoy the more simple things in Dubai, the local park, where parking and access was easy. Our local park now forms part of the new Dubai Water Canal, the cafe which showed outdoor movies is no longer there and the park has reduced by 50%. 2 years on, I now have to fight for parking space, the park is crowded and the main entrance is a long walk from the car park. Access to visit a friend and go to the bank now involves several U turns and driving in the opposite direction to reach our destination and since Box Park and City Walk opened the traffic is almost at standstill reaching our local supermarket. Our visitors come to Dubai with a certain level of expectation, they fail in advance to understand why we don't own our own jet ski, why we don't go driving over the dunes every weekend and why we're not having endless Champagne brunches and why we don't get taxi's everywhere. When they arrive they quickly find out why we don't do all this stuff. While a taxi in Dubai from the Marina to home in Jumeriah is only AED 47, the price of two coffees, they quickly realise that with the exchange rate that is still £10. Yes, it is cheap compared to living in other cities around the world, but the cost all mounts up. But what is getting me down at the moment are the people living here, no particular nationality, just individuals rights to do what they want and when they want. The lack of thought and respect for other people. Last night we grabbed burgers from the local restaurant to eat on the beach. A man walked out the door, cleared his throat and spat on the ground right outside the door. I had to stand and wait for him to finish spitting then step over the spit and when challenged he just looked at me with no idea what he had done or why I found it disgusting. On the beach we set up camp at 4pm, as the evening went on another family went to sit no more than 10ft in front of us, now there was no one else around so I politely suggested they might like to move a little further away which they did. But this back fired on me later when 20 odd kids arrived to join the family and were promptly told by the parents to 'be quiet and play somewhere else' you guessed it, that somewhere else was right in front of me and I was less polite telling the girls to stop screeching and the boys to stop throwing the sand in my direction. 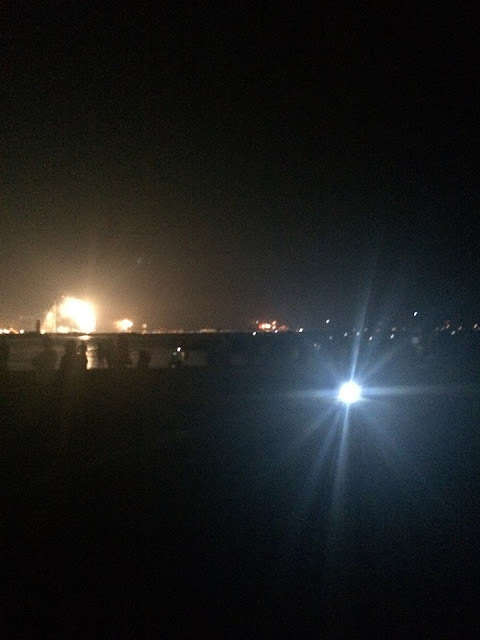 My final reason for why I am disappointed in Dubai, was some of the people who we shared the beach with who thought it was ok to use their camera phones to film the fireworks, nothing wrong with that you may think, but almost everyone had their back lights on their phones to enable them to get the lighting correct for their selfies and one guy came with a huge LED lamp that lit up most of the beach that he put down right in front of where we sitting, facing us on full beam. When approached he just had no idea why I asked him to turn it off, so feeling entitled also, I stood just a few feet in front of him to watch the firework display without being blinded. Last year I shared some amazing photo's of the firework display, this year most of my pictures look like this. I'm not sure we'll bother with New Year for 2017, I doubt we'll have any visitors next year, we may go to a different beach or the canal and just focus on one area rather than trying to see them all. We certainly won't be going to the Burj Khalifa, there were 650,000 people there queuing to get in from 5pm. The fireworks lasted 6 minutes. From watching them on the TV when we got home, there was a lot of smoke and I can only imagine it was sheer chaos trying to leave the area after the display. Anyway, onwards and upwards. It's a New Year. hope it's a good one for you all. Hi Suzanne, I am sorry to hear that things are changing over there. I can never get my head around the hoyking and spitting that some people think is acceptable over here, on what level can it ever be right. And I can so relate to the finding a nice space to have someone plonk themselves right on top of you without batting an eyelid. Too many people these days seem to lack consideration, which is daft as it costs nothing and makes for a better place to live. Wishing you and your all the best for 2017.... On a positive note maybe things can only get better? oh indeed things can only get better, but they'll get bigger and busier too. Oh my goodness! Sorry to read how things are changing and going downhill. The manners of the people around you sound appalling. Happy new year to you all the same. I hope 2017 is a good one for you! Oh dear that sounds disappointing. I guess as places grow bigger and bigger it loses it's natural feel. And what do you mean you don't drive over sand dunes every weekend? I completely understand where you are coming from. It's amazing when you actually live somewhere how different it can be.